The Phantom III was the third (obviously) Phantom model introduced by Rolls-Royce and the final large car introduced by the company before WWII. First shown in 1936, the company built just 727 examples before production was suspended in 1939. It did not return after the war. The body that this car carries was actually custom built in 1946 for the car’s second owner, as it was originally supplied with a limousine body. Freestone & Webb of London built this over the top, yet still gorgeous Sedanca de Ville body in a style that could’ve certainly been built in 1937. The windswept fenders and running boards are brushed copper over steel, as is the radiator and other trim pieces. The Phantom III was the first Rolls-Royce to be powered by a V-12 engine – and the last until the Silver Seraph went on sale in 1998. That V-12 is a 7.3-liter unit that makes an “adequate” amount of power (though in reality it was about 160 horsepower). This is a very striking automobile that has been making concours appearances since it was essentially new. It will be one of a few cars offered at Barrett-Jackson this January with a reserve. Click here for more info and here for more from this sale. 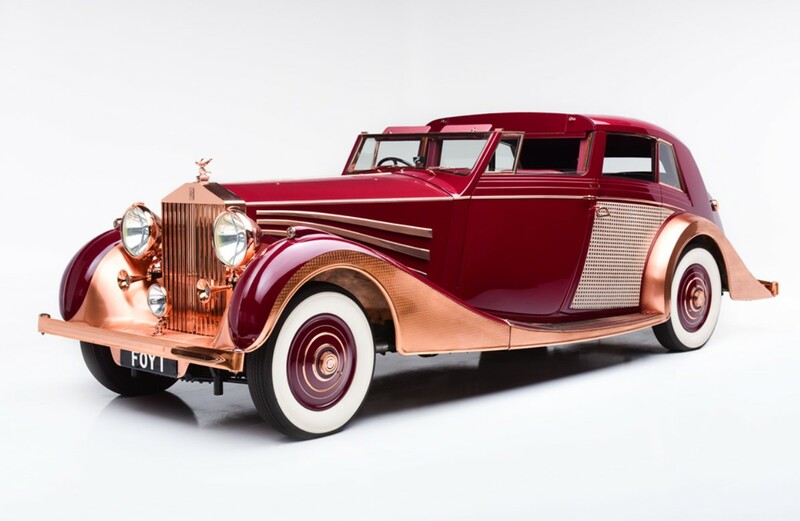 This entry was posted in Uncategorized and tagged 1937, auctions, barrett-jackson, cars, classic cars, freestone & webb, phantom iii, rolls-royce, sedance de ville by classiccarweekly. Bookmark the permalink.